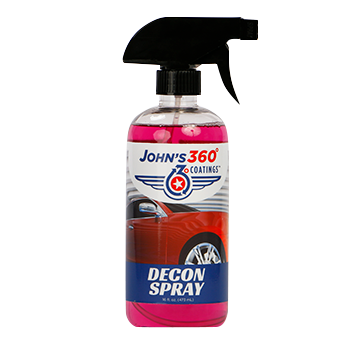 16oz — John’s 360° Coatings® Decon Spray removes old wax, oil and grease that may be present on the surface of your vehicle. The wax remover and degreaser is designed to prep surfaces for proper adhesion of ceramic coatings, waxes and sealants. It can also be used between polishing steps to reveal defects such as scratches or marring. For best results, completely clean your vehicle with John’s 360° Concentrated XP Foaming Soap or John’s 360° Waterless Car Wash before applying. Personal service. Relentless dedication to quality. Your happiness, or your money back.